I purchased her, two tone, mostly brown and orange atop, five years ago. 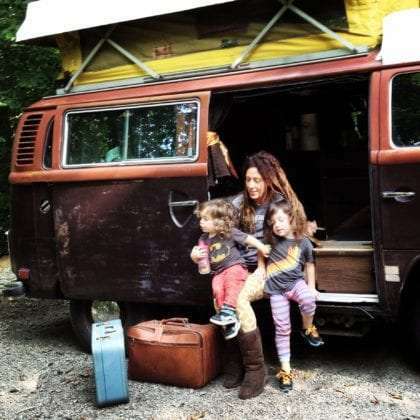 I’d already been on the road a year, living out of an ugly old Class C RV. But I knew I wanted her. She was like an old pair of boots, well worn and in need of a little use. So use her I did. In fact, I abused her. I ran her 70mph up and down the Rocky Mountains, through the Great Basin and into the Redwoods. My son in tow all the while, 8 at the time, I convinced the girl of my dreams to join us. We traveled the deserts of Arizona and Texas extensively, hugged the Gulf Coast and got lost in the Great Smoky Mountains. The three of us and our dog saw it all. We lived frugally, with no dedicated running water or electricity. We showered when we could, and didn’t when we cared more for freedom than hygiene. We cooked our meals on a fire, boiled water for coffee with a small propane heater, and broke down more often than most people brush their teeth. I became an expert at wrenching on the old girl. A new engine, new tires, some paint here and there. Life was grand. And then a new baby, and then another, came along. We traded her for an Airstream, but have taken her out every chance we got, whenever we return to Pennsylvania, where she hibernates in my dad’s garage. And so here we are again, this time with the two babies, now almost 2 and 3, as the oldest son visits grandparents, on the road and exploring the Appalachian Mountains. Living in a Bus is grand. You make friends easily, everyone from every walk of life wants to peek inside. Children stare wide-eyed as we drove by. Our own boys think of it as a clubhouse on wheels. A small fridge keeps our milk, cheese, meat and beer cold. We train an endless line of cars the lesson of patience as her four cylinders struggle 35mph up most of these hills. We make her two small beds, one a pull out couch, the other revealed as her top pops, both smaller than a twin, work for all four of us. It’s a tougher-than-most life as far as comforts, but it is a good life, and one to be proud of. Here’s to living, here’s to traveling, here’s to the Buses. Haha, shouldn’t you be charging for that kind of kne?lodgew!